There are many, many places in Maryland to celebrate St. Patrick’s Day this Sunday – and you don’t have to be Irish! As luck would have it, some of the best St. Patrick’s Day parties are within minutes of our apartments at Old Orchard, Burnam Woods, and Chatham Gardens. Down the road from Old Orchard Apartments in Catonsville there are two great celebrations. Caton Tavern on Edmonson Ave is having an Irish band and drink specials. Jennings Cafe on Frederick Road is having their famous Corned Beef and Cabbage for just $3.17. 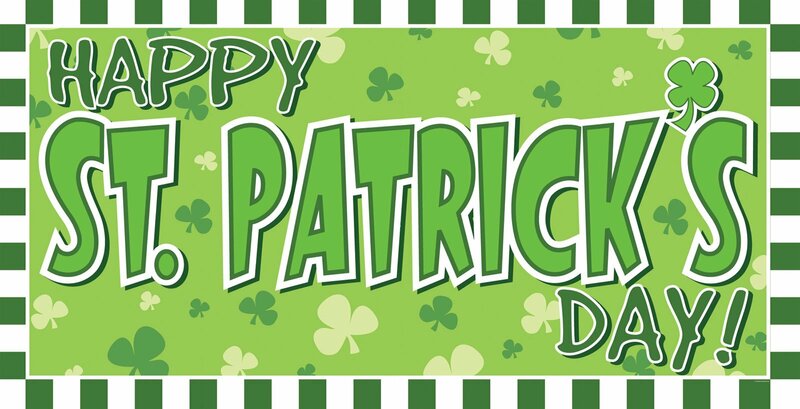 This Sunday March 17th there are three great St. Patrick’s Day celebrations at The Avenue at White Marsh across the street from Burnam Woods Apartments. Della Rose’s Saint Patrick’s Day Party features live music with Jenny Stephens from 3 – 6, Louie V. From 6 – 9, and Dj Cabbage Breath from 9 – close. There will be Homemade Corned Beef & Cabbage, $5 Car Bombs, $5 Irish Coffee, $5 Green Jug Love, and a House Specialty St. Pat’s Day Cocktail. St. Patrick’s Day Breakfast at Red Brick Station starts at 9am with Corned Beef Hash & Eggs breakfast and $2 Stouts. St. Patrick’s Day at the Kilt (the Tilted Kilt) starts at 8am. Just a couple of miles from Chatham Gardens Apartments is The 8th Annual Historic Ellicott City St. Patrick’s Day Irish Stroll. It is a pub crawl through Historic Ellicott City complete with bagpiper, featuring seven bars (Cocoa Lane, Diamond Back Tavern, Ellicott Mills Brewery, Judges Bench, La Palapa Grill & Cantina, Phoenix Emporium, Trolley Stop). La Palapa will feature a Jameson/Miller Lite OUTDOOR heated tent with music from 12pm-close. 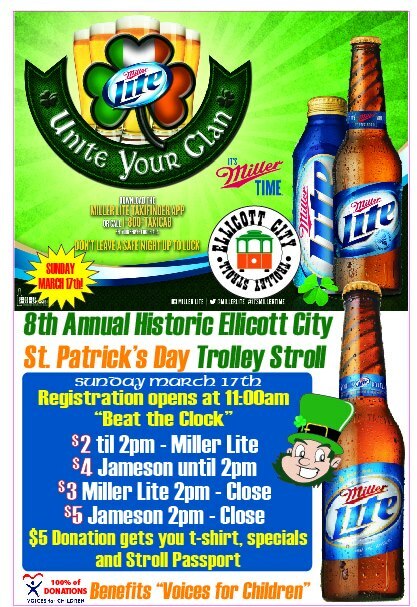 Register at the Jameson & Miller Lite tents located along Main Street on Sunday March 17th starting at 11am. A $5 donation to “Voices for Children” gets you an 8th Annual Historic Ellicott City bar crawl T-Shirt, Miller Lite lanyard, $3 Miller Lite, $4 Jameson’s at all of the participating bars, and a chance to win opening day tickets from Miller-Coors. Where will you be celebrating St. Patrick’s Day? Happy Purple Friday! Just two more days before the Baltimore Ravens take on the San Francisco 49ers in Super Bowl 47 – Ray Lewis’ last game. There are plenty of places around Maryland having great Super Bowl parties. 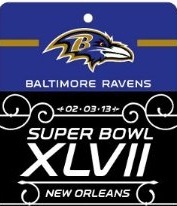 The Super Bowl party starts today at 3pm with the Ravens Pep Rally in the Alley at the side street of Della Rose’s. So those of you who live at Burnam Woods Apartments should head over to The Avenue at White Marsh this afternoon. There will be special drink and food prices, as well as prizes. Go back to The Avenue at White Marsh on Sunday where the Super Bowl party continues at The Tilted Kilt. If you live at Chatham Garden Apartments, you may want to check out Jilly’s Super Bowl party starting at 3pm Sunday. They are having $2.25 beers and $6. wings, pizza and nachos – and best of all no cover and plenty of big screen tvs to watch the game. For those of you at Old Orchard Apartments, drive down Frederick Road to Dimitri’s on Super Bowl Sunday for their buffet and drink specials.